This series of Family Stories spans the period from 1940 – 1965. While the stories revolve around our nuclear family – Mom (Laura McNeill/Skarsen/Wheeler), Dad (Dave McNeill), Louise, Dianne and myself – others, namely Aunts, Uncles, Nieces, Nephews, Cousins and friends, are drawn in whenever and wherever our paths intersected. The first 14 years, from 1940 – 1953, were the ‘gypsy years’ for our family as we regularly moved from one location to another until we landed in Cold Lake in 1953 where Louise and I completed Junior and Senior High School. Dianne, who was several years younger, was only starting school when Louise and I had both graduated. In 1965, two years after I moved to Victoria, B.C., dad passed away and a year later mom married Wilfred Skarsen, a well known member of an early pioneer family in Cold Lake. 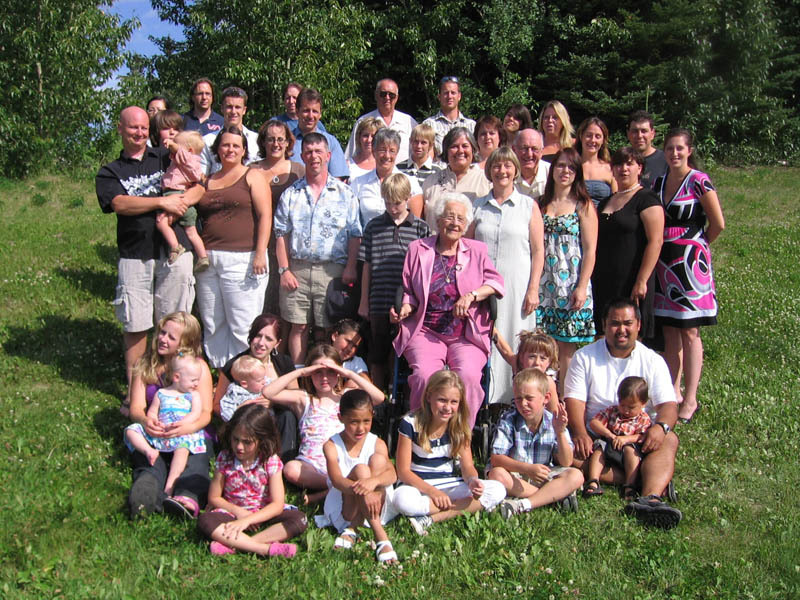 Following their marriage, the “W&L Skarsen” farm, along with Frank’s Marina, became focal points for family gatherings for over 35 years until Mom and Wilfred moved to Cold Lake in 2000. Following Wilfred’s death in 2002, mom continued to live in the home they bought until she passed away in 2008, a few months after her 90th birthday. Today only my sister, Louise and her husband Frank, along with two of their seven children and their families, continue to live in Cold Lake. My younger sister, Dianne, and her partner Michel, along with their youngest daughter, moved from Edmonton to Campbell River in 1996. The source material for many stories of the early years was, of course, our mother who had a phenomenal recollect of bygone days. She told countless stories to her children, grandchildren and others and, later life, while spending a year living in Victoria with Lynn and me, spent countless hours reminiscing about the early years. A story written by mom in the late 1970s, appears in the, “Treasured Scales of the Kinosoo”, a book edited by another Skarsen, Laura Dean Skarsen. The book profiles many of families who pioneered the Cold Lake area during the first several decades of the last century. The McNeill story appears on pages 227 – 229. To our lasting good fortune, mom took dozens of photographs of those early years with her trusty Brownie box camera. Many of the photos have been preserved and are complete with names, dates and places. Several will be presented within various stories. My sister Louise, with whom I shared so many of those early life experiences, was also a tremendous help in filling in details and helping to build the timelines as was her son, Lorin, who conducted several video taped interviews with his Grandma in 2004. From dad’s side of the family, the only surviving sibling, Aunt Pat (Humphries/Shirrmacher/McNeill), has been of immense help in filling in details of the early years around Birch Lake and Glaslyn. Further to this, a Genealogy Booklet researched and published by Carrie (Dewan) Goldsmith, provides meticulous detail of the McNeill, Dewan and Harwood families with some family lines dating back as far as the 1700s. The Genealogy also contains details dating back to Fifth Century in Ireland. The final invaluable resource is my wife and life partner, Lynn. She has read each story, sometimes several times, and made many suggestions for improvements. Errors or omissions that remain are solely my responsibility as Lynn has done her level best to help me improve the content and grammar. Perhaps, given sufficient time and energy, to say nothing of getting her to stop pulling out her hair, she will succeed in steering me down a path to becoming a better writer of short stories. Enjoy this bit of Family History. So many of the names you mention bring back memories of my early years in Cold Lake when my father, Fabian Milaney, was principal of the school and the first mayor of the town. He also taught at the base for two years before we moved from Cold Lake to Calgary in the summer of 1960. He and my mother, who was a Layton from Ardmore, have both since died. What a great site. I’m trying to locate a woman named Sally Jennifer who was from the Cold Lake area back in the early sixties. I met her when I was stationed at Namao air base in Edmonton. I was serving with the USAF 3955 air refueling squadron from rhe fall 1963 till the spring of 64. Sally was 22 at the time I was 21. Sally was my first love. I had orders to ship out to South East Asia and we lost contact after that. If any of you know the where abouts of Sally I would like to get reacquainted with her. She is First Nation, Blackfoot I believe. She is Catholic and may have attended a Catholic school in Cold Lake.